Trump warns Iran's president in all-caps tweet to stop threatening U.S.
WASHINGTON -- President Trump warned Iranian President Hassan Rouhani early Monday that he will face dire consequences for threatening the United States. Mr. Trump tweeted in all capital letters about the dangers to Iran of making hostile threats after Rouhani said Sunday, "American must understand well that peace with Iran is the mother of all peace and war with Iran is the mother of all wars." Within hours, Iranian state-owned news agency IRNA dismissed Mr. Trump's tweet, describing it as a "passive reaction" to Rouhani's remarks. The agency, a government mouthpiece, also said Monday that Mr. Trump's comment was only mimicking and copying Iranian Foreign Minister Mohammad Javad Zarif, who had in the past warned the West to "never threaten an Iranian." Mr. Trump earlier this year pulled the United States out of the international deal meant to prevent Tehran from developing a nuclear weapon and ordered increased American sanctions. 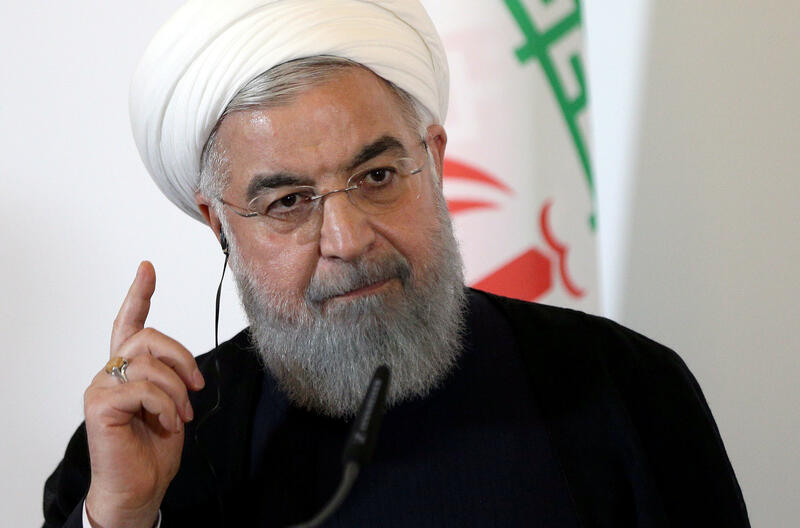 Rouhani had warned Mr. Trump Sunday to stop "playing with the lion's tail" and threatening Iran, "or else you will regret it." Mr. Trump has suggested Iranian leaders are "going to call me and say 'let's make a deal'" but Iran has rejected talks. Rouhani has previously lashed out against Mr. Trump for threatening to re-impose the sanctions, as well as for moving the U.S. embassy to Jerusalem and banning travel to the U.S. from certain Muslim-majority countries. Mr. Trump's early Monday tweet suggested he has little patience with the trading of hostile messages with Iran. Mr. Trump has a history of firing off heated tweets that seem to quickly escalate long-standing disputes with leaders of nations at odds with the U.S.
Of the tweet by Mr. Trump, the Reuters news service says, "The escalation in rhetoric came as the Trump administration has launched an offensive of speeches and online communications meant to foment unrest and help pressure Iran to end its nuclear program and its support of militant groups, according to U.S. officials familiar with the matter." In California Sunday, Secretary of State Mike Pompeo was strongly critical of Tehran. In a speech at the Ronald Reagan Presidential Library and Museum, Pompeo castigated Iran's political, judicial and military leaders, too, accusing several by name of participating in widespread corruption. He also said the government has "heartlessly repressed its own people's human rights, dignity and fundamental freedoms." He said despite poor treatment by their leaders, "the proud Iranian people are not staying silent about their government's many abuses." Israeli Prime Minister Benjamin Netanyahu praised Mr. Trump for his "strong stance" on Iran. Netanyahu said Mr. Trump and his secretary of state were taking a clear position against "Iranian aggression" after years in which the "regime was pampered by world powers." The Israeli prime minister spoke at his weekly Cabinet meeting Monday, after Mr. Trump's tweet. White House Press Secretary Sarah Huckabee Sanders told reporters on Monday that the president was responding to Iran and that he's "not going to allow them to continue to make threats against America. If anybody is inciting anything look no further than to Iran." Asked if he had consulted with this national security team before tweeting the edict, Sanders said that the president consults with his national security team "on a daily basis." National security adviser John Bolton said in a statement on Monday that he had spoken to Mr. Trump over the last several days, "and President Trump told me that if Iran does anything at all to the negative, they will pay a price like few countries have ever paid before." A high-ranking Iranian officer says Mr. Trump's Monday warning was nothing but "psychological warfare." Gen. Gholam Hossein Gheibparvar, the chief of the paramilitary Revolutionary Guard's volunteer Basij force, also said Monday that Mr. Trump "won't dare" take any military action against Iran. Gheibparvar's comments were reported by the semi-official ISNA news agency. Iranian lawmaker Heshmatollah Falahatpisheh told The Associated Press he doubted it would come to a military confrontation between Iran and the United States, despite the escalating rhetoric. Falahatpisheh says Mr. Trump and his Iranian counterpart "express themselves through speeches since diplomatic channels are closed" as the two countries haven't had diplomatic relations since 1979.